Reader Mari, fellow Friedman student and author of the cool blog Projects to Finish Someday, brought a cool site to my attention. It seems the old propaganda posters are gaining traction as a mechanism for rallying people to help fight global warming and create energy independence. You can see people's new poster submissions at Green Patriot Posters or get inspired by some of the old WW2 posters on their site. It is interesting to me that many of the same themes of decreasing consumption, self reliance, and sustainability are the same issues we are facing today. 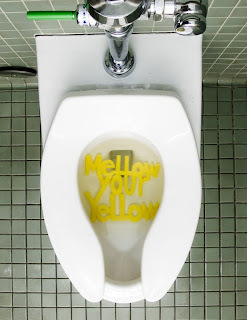 Mellow Your Yellow by pocktlynnt -Conserve at home by reducing water wastage on unnecessary flushes. Change by BPaulR -Human contribution to global climate change now appears irrefutable. We now know that humans can affect global climate for ill, but we can affect it for good too. We have changed the climate before, we can do it again. Make better change now. 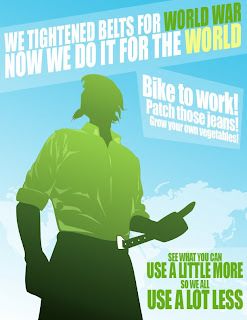 Use Less by iheartjavelinas -Uncle Sam reminds us we've tightened our belts before and we can do it again. With one-third of the world's cereal harvest and 90 percent of the world's soy harvest being raised for animal feed, the energy required to grow those crops are a major factor in these on-farm emissions. -Dr Rajendra Pachauri, Chair of the Intergovernmental Panel on Climate Change. Speech at Compassion in World Farming, London, September 8, 2008. The sheer number of animals being raised for meat on the planet is another reason livestock production accounts for nearly one-fifth of all the globe's greenhouse gas emissions. In 1965, 8 billion livestock animals were alive at any given moment; 10 billion were slaughtered every year. Today, thanks in part to confined feeding operations that have spurred faster growth and shorter lives, 20 billion livestock animals are alive at any given moment, but nearly five times that many—55 billion—are slaughtered annually. -United Nations FAO- The Global Food Economy: The Battle for the Future of Farming Tony Wies. 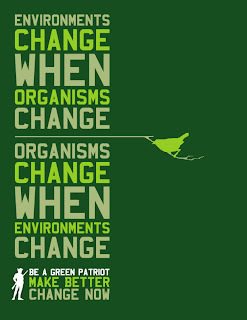 To see more or vote on your favorites, visit Green Patriot Posters. Subsidies to corn sweeteners in the U.S.